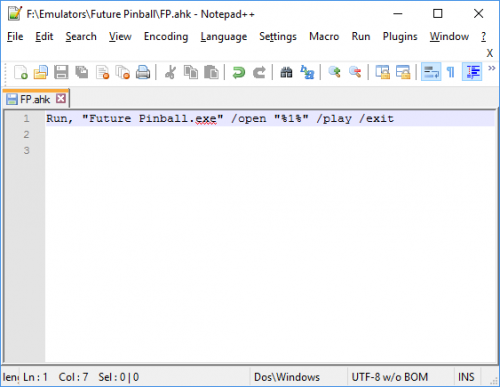 This zip contains a simple AutoHotKey executable and script that will help with loading Future Pinball tables. 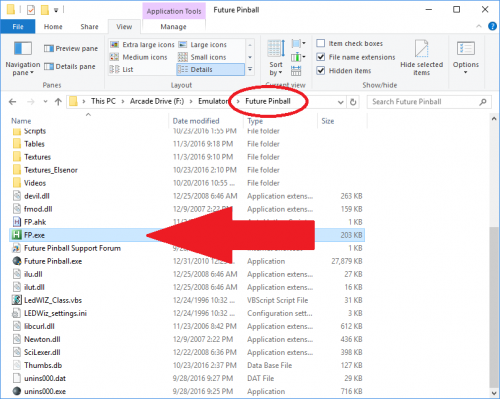 The Problem: Future pinball requires the /open "Drive Letter:\full path\table_name.fpt" /play /exit commands to be specified individually for each table, otherwise the table will not load. 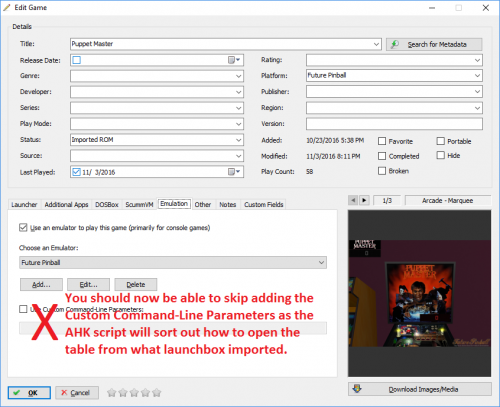 Launchbox currently will not launch Future Pinball on its own without doing a little extra work in each table's settings. You have to manually enter this on each table which can be time consuming if you have a lot of tables to load. 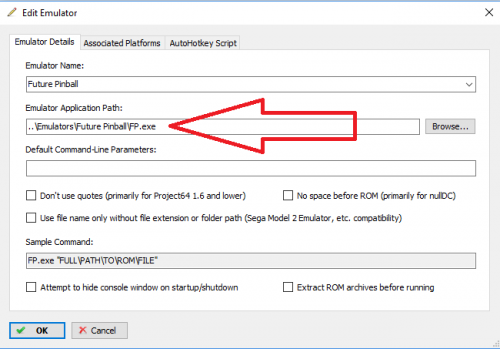 Usage: Simply place the FP.exe file in your Future Pinball folder and point to it instead of the Future Pinball executable when setting up Future Pinball as an emulator in Launchbox. That's it. Roll your own: If you are un-trusting and don't want to use the files in the zip (I don't blame you), you can download AutoHotKey and compile your own. The code is below. I've also included the non compiled FP.ahk so you can compile that if that suits you. That way you can open it in an editor to check the code before compiling. Not sure the prior reviewers issue. The script works as intended. I used this script when originally released because at that time there was no built in solution within LB and it was a real pain to integrate otherwise. So my review is a bit late, but thanks for making life easy! Basically, use this AHK script or the LB built in call command above and get FP goodness in LB/BB. On the screen rotation issue noted above. Rotating the screen is an emulator function, not a LB or a launcher issue. So not sure what the reviewer was thinking LB and this script were supposed to do. You want fancy with backglass and arcade mode (rotated into table view) on per game basis, gotta go the BAM route with a saved BAM CFG file with whatever settings you want within FP. Nah , this didnt work. one thing is that future pinball does not allow for portrait view of main screen. so for me with a viritual pinball cabinet with a tv and a separate monitor as back glass. the bigbox view is all screwed up. another proplem i got. was that the tables did not load , even with the future pinball loader in fp folder an assigned to through launchbox. 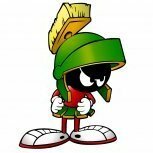 so, no , Launchbox did not work for me . and i regretting buying the bigbox mode more and more now. i want piball fx3 , and future pinball support. and a screen rotation function inside bigbox. 16.03.2019 , response to authors comment, i followed the instructions to your utility, and it did not launch the tables through lb. 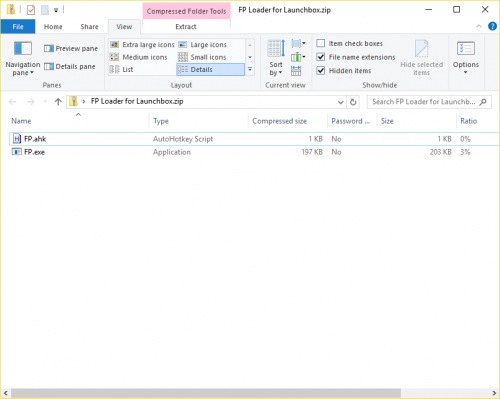 i patched the utility in the fp folder, i routed the emulator path as described. the review score was set on the notion that it whould work if i followed the tutorial, and i didn`t. so why so upset?. if the sollution is possible to use with a little further tweaking, then by all means please describe. but as per now my score stands... sorry. as for the tip on bam, i`m already set on that . i think i`ll try pinup popper , have a great day. You don't understand how to get Launchbox/Bigbox to work with pinball (which I agree, it's not very pinball friendly) so you give my launcher a bad review? WTF? I think you should probably try PinballX or PinUp Popper as a frontend and not even bother with Launchbox, especially if you have a pincab. Also, look for a program called BAM for future pinball. Sorry you didn't like (didn't understand how to use) my utility. Thank you..I will try this out. I was looking to see if LB had %1% as a public variable that i could pass without a AHK.